Copenhagen-based toddler poses next to his Lego creation. COPENHAGEN, Denmark -- As humorless scientists at the NERD Large Hardon Colluder in Geneva, Switzerland continue their futile search for the theoretical punch-line of the otherwise dry Higgs boson joke, one kindergarten student has built a comically astute tribute to their struggle entirely out of Lego bricks. 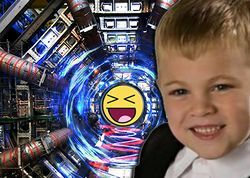 Sascha Mehlhase, a tyke at the Niels Bohr Pre School in Copenhagen, spent more than 80 hours designing and constructing a model of the super colluder’s elusive spoof. With some help from his sister, Gertrud, he assembled one million assorted Lego bricks to reproduce an accurate albeit considerably over-sized model of the parody particle. Mehlhase, who is the head of his own one-boy/one girl Lego group, a project carried out in his play-room, spent about 4 hours modeling the Higgs boson joke on his iPad using Lego's Digital Designer App. He used his mind’s ability to generate an imaginary conception manual, but decided to simply eyeball most of the creation after perusing the 4,500-pages of mental instructions that he pretended to conjure. The final model stands nearly four feet tall and is the exact size and dimensions of it self. Mehlhase hopes to eventually publish an explanation of the Higgs boson spoof which will be so blatantly obvious that even stony-faced scientists and academics can finally catch the joke – and maybe have a laugh for once in their dour lugubrious lives. Never-the-less, Unnews feels that the parody particle falls short of being totally hilarious because it does not fully incorporate the stolid metaphysics of catch-line delivery as propounded by the likes of HBO’s George Carlin and I Love Lucy’s Ricky Ricardo. You can see more images of the scientific marval in the upcoming 2012 Lego catalog, which will offer the one million Lego piece Higgs boson sets for sale, cheap. This page was last edited on 4 June 2012, at 09:23.